Why Diabetic Sports Shoes are Important? The primary goal of diabetic sports shoes is to prevent complications like strains, ulcers, numbness calluses, for patients with diabetes when they are actively involved in a physical activity. Walking or jogging regularly is one of the most important activities that most doctors suggest for diabetic patients. But problems like foot ulcers are common complications that prevent them from performing the same. The primary cause of ulcers and other such foot problems in diabetes patients is excessive pressure on a particular portion of feet combined with the break-down of skin. Corns and calluses aggravate the likelihood of such complications. To make sure that healing is fast and steady, it is critical that pressure is relieved from the affected area and good wound dressings are used. Our sports shoes have been designed to be extremely light in weight so that diabetics don't feel any pressure under their feet. Moreover, they provide ample room for toes and allow air to circulate freely. These diabetic sports shoes have no heels or pointed toes thus reducing the pressure on feet. Available for sizes starting from 6 to 11. Key Specifications for Health Plus Diabetic Sports Shoes: Uppers: Premium Cloth & Leather Outer Sole: High Quality PU Sole Innersole: High Quality MCP/MCR sole to give feet & sole the needed comfort & the stability Colours: Black & Brown Why Diabetic Sports Shoes are Important? The primary goal of diabetic sports shoes is to prevent complications like strains, ulcers, numbness calluses, for patients with diabetes when they are actively involved in a physical activity. Walking or jogging regularly is one of the most important activities that most doctors suggest for diabetic patients. But problems like foot ulcers are common complications that prevent them from performing the same. The primary cause of ulcers and other such foot problems in diabetes patients is excessive pressure on a particular portion of feet combined with the break-down of skin. Corns and calluses aggravate the likelihood of such complications.To make sure that healing is fast and steady, it is critical that pressure is relieved from the affected area and good wound dressings are used. 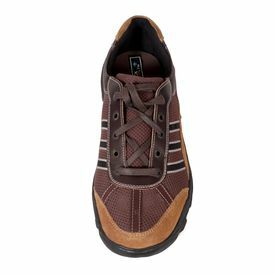 Here is where our Diabetic sports shoes with custom-molded inserts help you by acting as a preventative system to avoid foot injuries and improve mobility and reduce the chance of damage re-occuring, Our sports shoes have been designed to be extremely light in weight so that diabetics don't feel any pressure under their feet. Moreover, they provide ample room for toes and allow air to circulate freely. These diabetic sports shoes have no heels or pointed toes thus reducing the pressure on feet. Available for sizes starting from 6 to 11.